The Club was established in 1973 and has been based in St. Marks’ House since 1983. We have had over 30 eventful years of providing a service to young people of the Parish. The Club began in Springfield in a prefabricated building on the church grounds www.stmarksspringfield.com. In 1983 the prefab was destroyed, this lead to the Club been relocated to its present address which is St. Marks’ Youth & Family Centre, locally known as ‘The Farm’. The premises are situated on a two acre site and consist of a six room 18th century house and many outbuildings. One of these outbuildings is a large barn which was converted into a sports hall and games room. 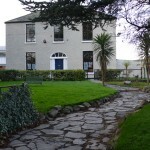 There is a small urban farm which was the first of its type in Ireland. The Club provides a wide range of activities to the local community, such as a Playgroup. We also provide a premises for Drama Beans, Tallaght Youth Services, Jokers Club, XQuisite Dance, Fettercairn Clubs, Karate, Foròige Clubs and Parent/Toddler Group. We also have a meeting room which is available to Local Residence Associations and other organisations. The aim of the Club is to provide the area with a facility that can be used by groups and organisations to provide a service that can be used for Sports, Educational, Community and Youth based activities. The History of Fettercairn House. Fettercairn House (renamed St Mark’s House in 1985) appears on the first ordinance survey map of Ireland printed in 1837. The House is situated in the townland of Whitehall in Tamhlacht (Tallaght). The owner at that time was a Mrs Gregg, whos landlord was Sir James Hawkins Bart. The House was situated on 400 acres of prime farm land, and had a beautiful tree lined avenue, which has since been destroyed. The farmyard was first concreted in 1920 by its then owner Mr Patrick Mooney. The yard contained two large sheds, three smaller sheds and a well. Both the well and the two large sheds have been preserved. The Mooney family bought the house in 1883 and have passed the House down through the family for nearly a hundred years untill it was eventually sold in 1973. The property was later taken over by Dublin County Council and was used as a Park’s Depot for a number of years. In 1983 the House was given to St Mark’s Youth Club after their original clubhouse blew down in a storm.